To call the Dreamy Goat app, developed by Arthur Lysenko for the iPhone and iPod touch, merely a game would be calling it a disservice. 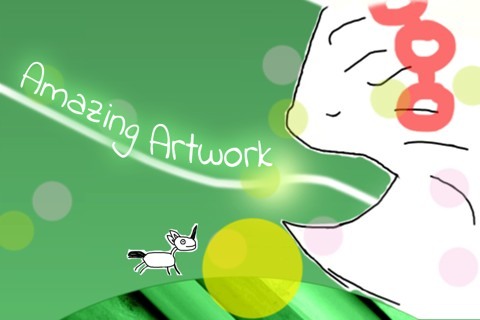 While it does feature some video game qualities, unlike other apps, Dreamy Goat’s strength is in its art and music design. 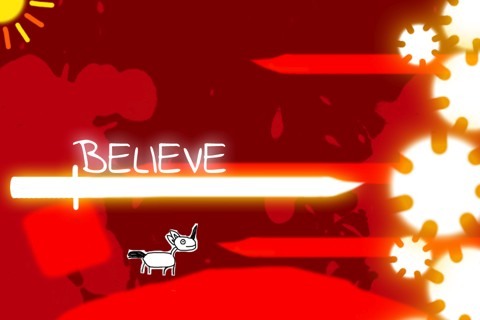 As Goat, you must navigate through any of the seven available levels, with each level representing one of his dreams. Goat is in constant movement with the objective of this iPhone app differing based on which mode you play. Dreamy Goat offers two modes: Sun and Zen, with each of the seven levels available in either mode. In Sun mode, your objective is to outrace the sun; this is accomplished by collecting items in your path or jumping on objects as they appear. If you fail to collect enough items or jump on enough objects, the sun shines bright and Goat wakes up, ending the dream. In Zen mode, the sun is absent, allowing you to take in each level’s visuals without the need to collect any items. As one would expect, the controls for this app are simple and work well. Goat is constantly in motion and tapping the screen causes him to jump; if you continue tapping while jumping, Goat jumps higher and higher. Jumping is responsive and overall, the controls are easy to master even on your first playthrough. Where Dreamy Goat excels is its visuals. Each of the seven dreams Goat can visit vary wildly in color. For example, one dream features light shades of cotton candy pink while one dream features dark blacks and greens. Each level features hand drawn artwork presented in a surreal fashion, almost like images from a children’s book. While the animation for Goat is very basic, at most being only a few frames, it fits in well with the overall look of the application. Each of the seven dreams feature a large amount of artwork just for that level; this is where Zen mode comes in handy for those players who care more about the artwork than playing the app. The music is a great compliment to the visuals, with each dream featuring its own song, and each song being a soothing, calming melody that fits in well with the idea of exploring dreams. Over the course of this review, performed on an iPhone 4 with version 5.1 software, Dreamy Goat ran perfectly with no problems to speak of. Dreamy Goat is a hard application to review. In terms of gameplay, there isn’t a lot to do but in terms of artwork, Dreamy Goat is amazing. As a playable iPhone app, Dreamy Goat doesn’t hold up but as a visual experience, it’s definitely remarkable and worth experiencing. AppSafari review of Dreamy Goat was written by Joe Seifi on April 9th, 2012 and categorized under Adventure, App Store, Featured, Games, Music. Page viewed 3996 times, 1 so far today. Need help on using these apps? Please read the Help Page.